Ok, yes, everyone seems to be at PDC and those who aren’t are getting sick of all of the hype. But hey—PDC only comes along every few years, so we have to take advantage of it when it does! Things are starting to come alive here at the convention center in LA. 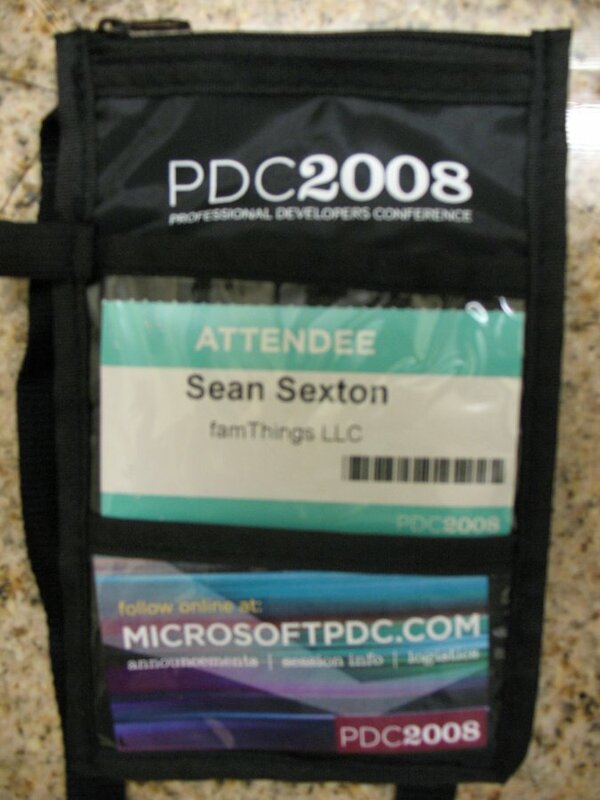 I stopped by yesterday to pick up my badge and “swag bag”, but didn’t attend any of the pre-conference sessions. Swag bag: I didn’t see any signs yesterday directing me to where I might get my swag, but I started watching the geeks wandering by who DID have bags and followed the geek-trail backwards. I was a little disappointed not to get the external USB drive in the swag bag that we’ve heard about. Instead, I score a silly mug, geeky t-shirt, conference booklet and a crapload of 3rd party adverts. But then I noticed that I had a second ticket for picking stuff, and it mentioned being valid only after Tuesday at 1PM. Ahh, got it. The USB drive is going to contain the Windows 7 alpha, as well as probably copies of all of the session slides. So Microsoft doesn’t want the alpha or session info “in the wild” until it is officially “released” at the keynotes. Speaking of keynotes, today’s will feature Ray Ozzie and Bob Muglia and starts in about an hour. Two hours of Ozzie goodness. Tomorrow, we have another 2-hr keynote with Ray Ozzie, Steven Sinofsky, Scott Guthrie and David Treadwell. 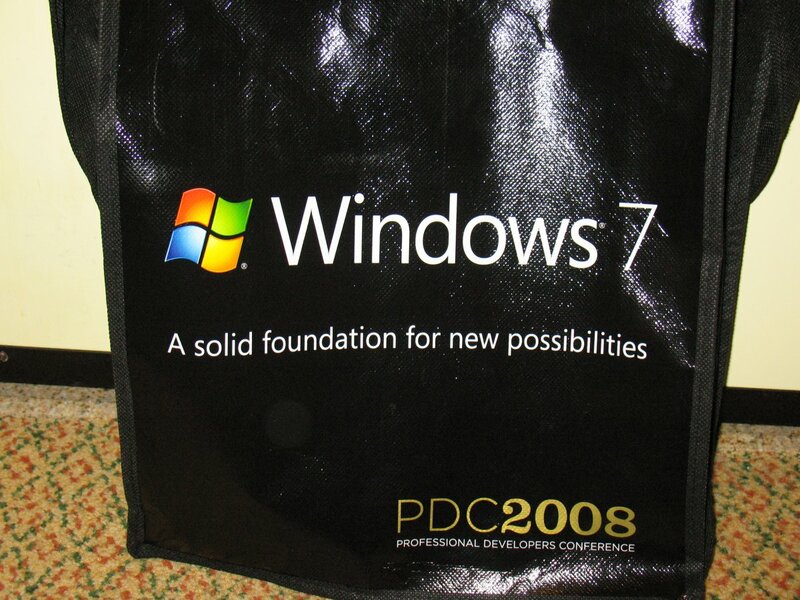 So far, it’s clear that Windows 7 will be prominently featured at PDC. Posters and market splashes are everywhere. You’ll do fine if you just mentally subsitute “Vista 6.1” whenever you read the marketing-derived “7”. Also promising to make a big splash here at PDC–Live Mesh and cloud computing. More to come.. There will be five session slots today, starting at 11:00 AM and running through 6:30 PM. I plan to blog rough notes from the sessions that I attend, if I have time. Oh, by the way–LA is supposed to hit a high of 86 degF today, and sunny. (Well, in LA, “sunny” really means “mostly smoggy”). Thinking fondly of my fellow Twin Citians and the first snow flurries of the season.